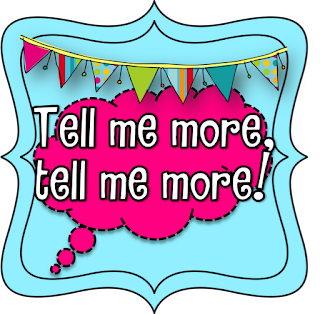 I'm linking up with Amy Lemons over at Step Into Second Grade for her Tell Me More, Tell Me More Linky Party. 1. First and foremost, I am a Christian. My family goes to church every Sunday and we love having God as the center of our lives. I LOVE this verse. 6. I love working out. I have not had the time to this summer as I've been super busy finishing up my classes and preparing for presentations this summer, but during the school year, I love to exercise. I wear a heart rate monitor that counts my calories when I work out and it makes me feel SO good to leave the gym knowing I burned 600-700 calories in an hour. Awesome! Well, that's me in a nutshell. My favorite clothing attire is jeans and a t-shirt with hair in a ponytail, little to no make-up. I'll end my post with another pin that I just love and it totally fits the moment. Now, it's your turn! Let us know a little about you. Link up with Amy Lemons by clicking the button below. Have a great night! It was so fun to read about you! I used to like exercise, but somewhere along the way, it go more difficult. Now I prefer to be "lapped" as your quote stated ;) I'm just going to have to get up and do it though! That is a great Bible verse. Thanks for sharing all the fun things! I really need to get a heart rate monitor...are they super expensive? I have been working out all summer, but I don't LOVE it yet. But it is becoming a part of my life and even when I don't want to go, I just GO. I hope I can learn to love it as much you do! I love to work out to. It keeps me fresh and energized! Thank you for sharing! I loved the book Water for Elephants. It's a lot better than the movie. I totally get your lingo. Husbands don't have a clue!! @Katherine, yes the heart rate monitor is quite expensive but if you're counting calories, it is well worth it to determine what a good workout IS or IS NOT. I think mine was around $100 at Target. Good luck!